Ryan Tannehill completed passes on the first four plays in his return from two serious injuries to his left knee. 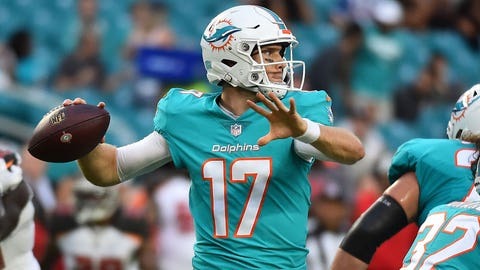 MIAMI GARDENS, Fla. (AP) — Ryan Tannehill completed passes on the first four plays in his return from two serious injuries to his left knee, sparking a 40-yard drive that ended with a missed field goal in his only series, and the Miami Dolphins lost their exhibition opener to Tampa Bay 26-24 Thursday night. New Buccaneers kicker Chandler Catanzaro made a 26-yard field goal with 23 seconds left to cap a 67-yard drive and give them the win. Ryan Fitzpatrick led the Bucs on a 57-yard, six-play touchdown drive on their first possession. It was capped by Peyton Barber‘s 4-yard run. Miami’s David Fales, battling Brock Osweiler for the backup QB job, led the second-string offense to a field goal against the Buccaneers’ first-team defense. Fales also directed a 75-yard touchdown drive in the second quarter, and he finished 8 of 11 for 115 yards. Osweiler went 10 for 21 for 83 yards. Dolphins fourth-round draft pick Kalen Ballage rushed for 37 yards in 10 carries and caught three passes for 23 yards. He also lost a fumble. Bucs second-round pick Ronald Jones was held to 9 yards in eight carries, but scored on a 2-yard run. Catanzaro missed his first extra-point attempt and missed a 53-yard field goal try, but also made two field goals. Rookie Jason Sanders, battling rookie Greg Joseph for the Dolphins’ kicking job, made field goals of 29 and 23 yards but missed a 53-yarder. Joseph made a 48-yarder. Bucs: CB Vernon Hargreaves III left in the first quarter with a groin injury and didn’t return. … First-round draft pick DT Vita Vea didn’t play. He has missed most of training camp with a calf injury. Dolphins: Reserve LB Mike Hull left the field on a cart in the second quarter with a left knee injury. Buccaneers: Tampa Bay plays at Tennessee on Aug. 18. Dolphins: Miami plays at Carolina on Aug. 17.